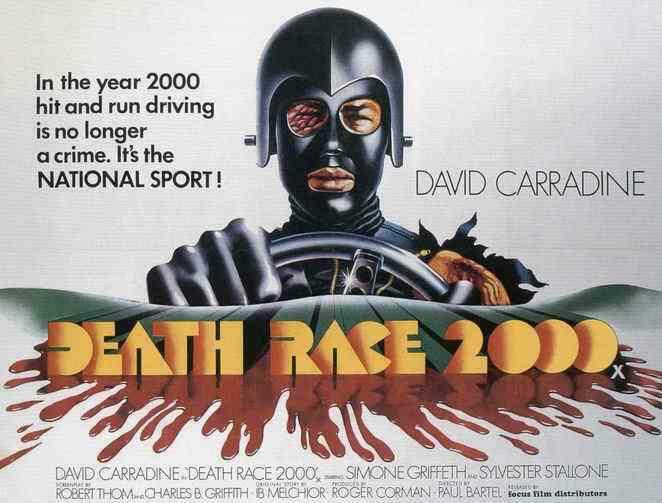 ‎1975’s “Death Race 2000” heralded in my most celebrated guilty pleasure. The total futuristic gore fest dystopia bloodbath films. There are others that should garner more love but for me “Death Race 2000” left the most scarring and fantastical impression. The film gives us a future of cross country racing like no race before. The hit and run becomes a celebrated pass time to appease the masses and bring down the population totals. Points are accumulated and tallied based on pedestrian qualities such as status in society, innocence, health, and all that range between. Things that make our real society focus on proper road edicate are distorted into a festival of cruel brutality. It makes this vision of an unsettled future bizarre and fascinating all while forcing us to question our sensibilities of what is acceptable in society. David Carradine’s character is cold and calculative while maintaining his humanity. While most driver’s in the movie go for the easy scoring targets he goes for the higher scoring overlooked targets. This makes his character a more likable representation of a Death Racer. This film kept me captivated as a kid with it’s cruelty and psychotic transformation of what I considered society consisted of. A set of rules and moralities that allowed for a safe and orderly existence. This movie threw all that out the window and there was no real reason for it other than society had become filled with blood thirsty madmen held high by corporate/government power and influence. The film took everything about the world as we knew it and threw it into the fire to listen to the sizzling of a fired carcass. To this day this movie runs through my mind as I slow for a red light while some one crosses the street. Even entering a hospital or shopping center parking lot brings images of altered metallic beasts souped up with claws and knives of steel jutting from every available point rushing through the car park wiping out those who where to slow to make it inside or into their cars. “Death Race 2000” is a total exploitation of violence and lawlessness that brings the gore. The dialogue is minimal and the kills are gruesome. It is a fun ride into an apocalyptic hell where hero’s are madmen in hot rods of horror. A great film that is easy to watch, filled with death and brutality. There is even a message about being to content with societal standards. For me this was the movie that made me fall in love with futuristic flicks about a near apocalyptic world where anything goes. Truly one of my most indulged guilty pleasures.